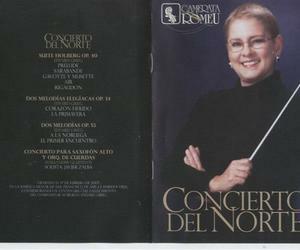 The first DVD by Camerata Romeu, called Concierto del Norte, pays tribute to the Norwegian composer Edvard Grieg (1843-1907), considered to be the main music representative from his country. The DVD belongs to the Bis Music recording label, and it contains the recording of a concert which took place in 2007, on occasion of the hundredth anniversary of his death. The concert was undertaken by this Cuban band, led by Professor Zenaida Romeu. That performance became an audio-visual material, making constancy of the virtuosity that distinguishes the first female chord band in Latin America, who presented recently the DVD in our capital. For that occasion, there were interpreted pieces such as Suite Holberg op.40, Two Elegiac Melodies op.34 and Two melodies op.53, by the Norwegian composed, together with the Concert for High saxophone and Chord Orchestra, by the Russian musician and composer Aleksander Glazunov (1865-1936). According to the critic, the Camerata production of Grieg, is not as abundant as his vocal or piano work, but includes beautiful examples, such as the three violin sonatas, the Sonata for cello or the two chord quartets. It is acknowledged, that the work that made him most popular was the incidental music for the play Peer Gynt, a theater drama by the Norwegian Henrik Ibsen (1828-1906).